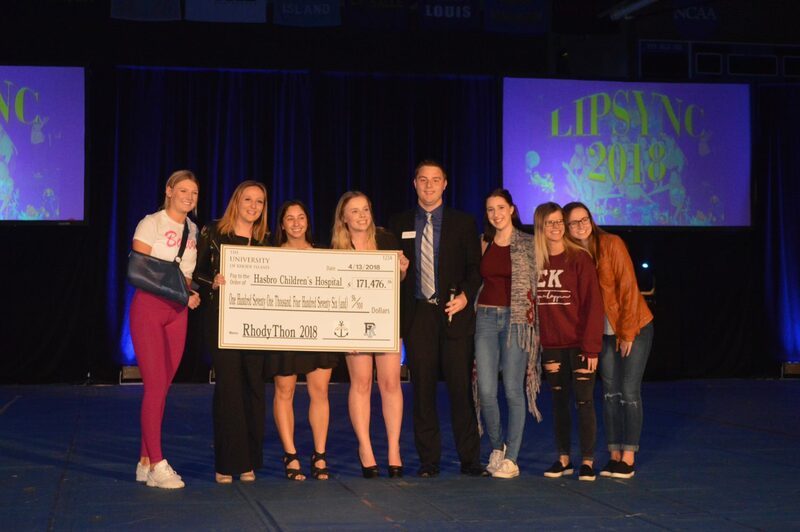 Photo contributed by Mikayla Gempp| Greek week continued to break fundraising records, with this year’s grand total of $160,000. Last week, the University of Rhode Island’s fraternities and sororities held their 78th annual Greek Week. “It’s a friendly competition just to have some fun and raise money,” Assistant Dean of Students, Steve Simo, said when describing the event. During Greek Week, sororities and fraternities are paired with each other to compete for Greek points each event during the week. The team that earns the most Greek points wins a trophy and bragging rights. This year, the team consisting of sorority, Phi Sigma Sigma and fraternities, Delta Chi and Phi Kappa Psi won Greek Week. Each pairing is also given a theme to represent throughout the week. This year’s theme was Pixar, with each sorority and fraternity combination being assigned a Pixar film to express throughout every activity. The winning team’s theme was the film Wall-E.
Greek Week began on April 7 with the Jared Bergman Memorial Softball Game and Chariot Race. An opening day field day occurred on April 8, which included activities such as tug-of-war, sack races and water balloon toss. On April 9 Greek Life hosted the Mr. and Ms. Greek Week competition.This competition included a formal wear portion and a talent competition. Mr. Sigma Alpha Epsilon, Ian Pascoe, was crowned Mr. Greek Week, and Ms. Sigma Delta Tau, Madison Argandona, was crowned Ms. Greek Week. On April 10, sororities and fraternities played broomball, an ice hockey game with brooms, in Boss Arena. April 11 featured a capture-the-flag game, while April 12 involved a singing competition called Greek Sing. 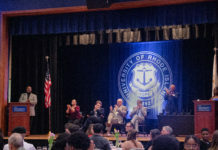 The week concluded with a LipSync competition on April 13. According to Simo, students participating in Greek Week can learn many skills that they can apply throughout their lives. Although some members of Greek Life were concerned about the week’s festivities after Student Senate cut the budget by $7,000, many members of the community said it was still a huge success. Members of Greek Life were able to raise $160,000 over the course of Greek Week to the Hasbro’s Children’s Hospital. “Generally, in years past, Greek Life has raised money [during Greek Week] that has gone to the foundation, but this year, with Senate pulling a lot of the funding, it might be kind of a break-even, so we’ll have to see how that washes out. But we still have a lot of fun with this week and build a lot of camaraderie,” Simo said. The camaraderie that the week builds helps to get students excited for fundraising and Greek Life in general. Jared Cinotti, a brother of Theta Chi, said Greek Life has been a valuable part of his college experience. 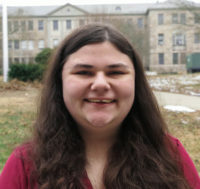 “The best part about Greek Life is getting to meet new people every day,” said Cinotti. His favorite part of the week was attending LipSync, where he was able to enjoy watching many of his friends perform. For Simo, his favorite part of Greek Week has always been working with student leaders. Together, they’ve been able to enjoy the traditions of the week and keep the celebrations consistent from year to year.